Back to school season is something you notice no matter your age — it always feels like a time to start fresh. How is your little one adjusting to the new school year? After a long summer spent eating what more of what they want (ice cream, candy, etc.) and spending time away from home at friend’s houses and on vacation, their smile may have taken something of a beating. Celebrate the return to sanity (er, school) with a visit to a kids dentist! Your child is at a higher risk of cavities than you are. While they’re between the ages of 6 and about 14, their tooth enamel is still developing and isn’t quite hard enough to fully guard itself against the acids and bacteria that collect on the teeth throughout the day. Summer poses a special threat to a young person’s smile. A break in the routine can mean laxer brushing and flossing. The toothbrush may accidentally be forgotten when you’re on vacation or while they’re away at friend’s house. And every kid loves a nice ice cream cone in the summertime — but when those sugars get left behind, they attack and weaken the tooth enamel, opening your favorite smile up to problems. 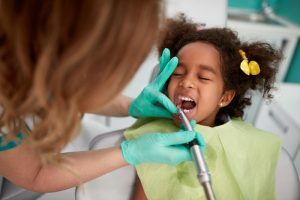 During a back to school checkup and cleaning, Dr. Derren Tippets or Dr. Michele Lacy will look out for cavities and infection with x-rays and a thorough visual examination. 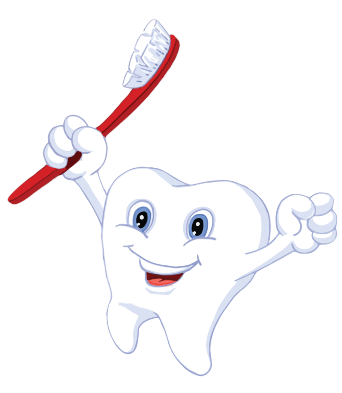 Our hygiene team will also clean away plaque and tartar and apply a fluoride treatment to strengthen the tooth enamel to prevent decay. If your little one doesn’t have dental sealants yet, your dentist will recommend those for a new, healthy, cavity-free school year. Our hygiene team will also provide important tips in kid-friendly language to encourage better brushing and flossing techniques at home. It’s important that you reinforce these, too — after all, you are your child’s number one ally as they begin on their journey to a lifetime of good oral health. Many kiddos are reluctant to brush and floss their teeth. Buying a toothbrush and paste that’s themed in their favorite characters can help. So can making a progress chart — tick off every day they manage to brush and floss properly, then reward them weekly or monthly for good hygiene habits. Do your best to make sure your little one is eating a balanced, nutritious diet. Stock your cabinet and fridge full of low-sugar snacks kids love — low-fat cheese sticks, plain yogurt, and whole fruits are all good ideas. And perhaps the most important tip of all? Don’t forget that your child looks up to you for everything! Make sure you’re taking excellent care of your own teeth with regular hygiene and frequent trips to the dentist. Let’s Book That Visit Today! School’s already started, but that doesn’t mean it’s too late to schedule a back to school visit with the children’s dentist. We invite you to request an appointment at Treasured Teeth today!